Lori is the co-founder and owner of Kids Cooking Green. After several years of teaching cooking classes to children in after school programs, Lori recognized the need for a more formal program that stressed real cooking and hands-on lessons while emphasizing the importance of local food, the impact it has on the environment and food as a social experience. Lori co-founded Kids Cooking Green with this in mind, realizing that if you teach the children about good food, the lessons will last a lifetime. 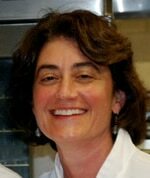 Lori is also a co-Founder of the Lexington Farmers’ Market, voted Best of Boston in 2010 by Boston Magazine! Lori is a graduate of the University of Massachusetts at Amherst with a B.A. in English and The New England Culinary Institute in Montpelier, Vermont. She owned and operated Sweet Deliverance Catering in Winchester, MA and was the co-owner of Noodles Cafe. She and her husband are currently co-owners of Dave’s Fresh Pasta Shop in Somerville, MA. Lori has two grown children and over 25 years experience working in the restaurant business. Kids Cooking Green has the support of the Mass Farmers Markets a 501(c)(3), not for profit organization.